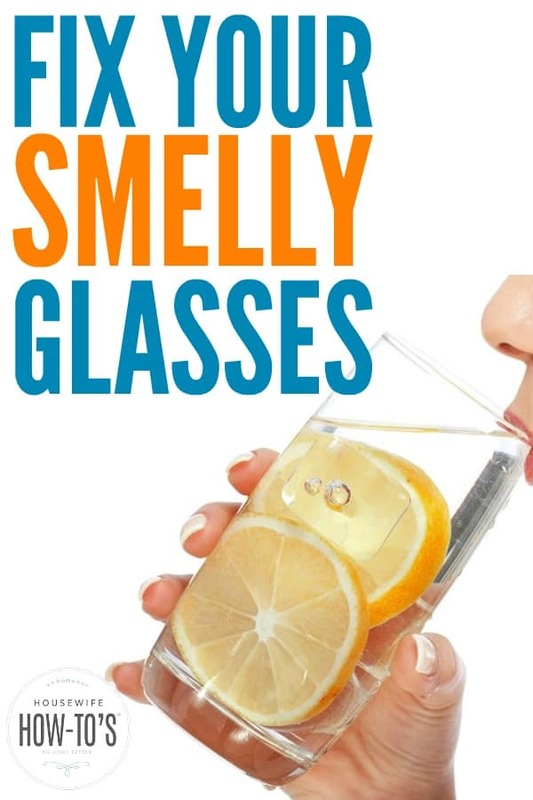 Do Your Drinking Glasses Smell Bad? Here's Help! 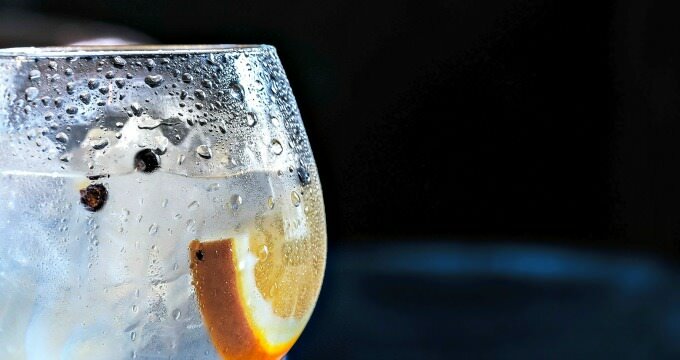 Home » Drinking Glasses Smell Bad? Here’s How To Fix It! Drinking Glasses Smell Bad? Here’s How To Fix It! Do your drinking glasses smell bad after washing? Maybe your glassware comes out of the dishwasher stinking like fish or a wet dog? It’s bad enough when you’re thirsty and get a whiff of something not right. When guests notice that odor, it’s downright embarrassing. Do your drinking glasses smell weird? Ever since the EPA required soap manufacturers to remove phosphates from dishwasher detergent, many of us have noticed our drinking glasses smell bad even after washing them. Some liken the smell to fish; others say it’s more like rotting meat or a wet dog. As if the smell wasn’t enough, you might also see your glasses don’t look clean after washing. Instead, they have a cloudy haze that makes them look grimy. Over time that film builds up, and your once clear drinking glasses look etched. If you do nothing, that can become permanent. That haze, even if it’s not built up sufficiently to be noticeable yet, is the source of the smell. Unlike perfectly smooth glass, the film left behind by our phosphate-free detergents is rough enough to hold onto bacteria. And where bacteria breeds, odor breeds. There are a couple of ways to treat this problem, depending on whether you hand-wash your glasses or stick them in the dishwasher. In the sink: Line the bottom of your basin with a thick towel and arrange glassware on it. Add 2 cups of distilled white vinegar then run the hot water until the glasses are completely submerged. Wait 20-30 minutes to give the vinegar time to dissolve and remove the odor-causing haze then scrub, wash, and dry them thoroughly. In the dishwasher: Add 2 cup of white distilled vinegar to the first rinse cycle. Let it run for a minute or two then pause the cycle for 20-30 minutes (in most dishwashers, this involves popping the door open) to give the vinegary water time to dissolve the haze. Next, close the door and allow the cycle to continue as usual. • To prevent hazing in the future, fill your dishwasher’s rinse aid reservoir with white vinegar — it works just as well Jet Dry or similar products and saves money, too. • Deep clean your dishwasher regularly to ensure it’s not circulating bacteria-filled water or growing hidden mold. • Or skip the dishwasher altogether and hand-wash your drinking glasses then let them air dry on a dish rack that allows for proper air circulation. The too much soap thing is good to know! I throw a pack in the bottom and one in the dispenser during the extra long cycle. I have tried everything.. changing detergents, rinse aids, deep cleaning the washer with vinegar, deep cleaning it with a “special made cleaner”, Rinsing prior with cold water, rinsing prior with hot water, pre soaking dishes (we usually load as we cook and wash immediately after eating). I have even tried cutting the load in half and spacing things out more(I am a freak about how things go so I don’t over load it anyway). I have tried all the cycles/lengths. Hand washing our knives they were soooo gross smelling after. If using less detergent does not help then I am beginning to think it is our city water!! I am almost to the point of throwing our dishes away b/c they smell so bad! I’ve never heard of adding a second pack to an extra long cycle. Since there’s not a rinse midway through, it seems to me like adding more shampoo halfway through washing your hair — I mean, you’ll get more suds but they’re not getting rinsed away before adding more, so maybe the rinse cycle can’t get rid of it all? I think I’d try cutting back to one pack in the dispenser, period. The extra long cycle is about giving the water more time to work on the grime, and that should be enough — with one pack — to get your dishes cleaner. But before you toss everything out, give that vinegar soak a chance on your glasses, utensils, and dishes. Good luck! We are also going crazy with this horrific odor. We, also find, when our windows are open, everything smells worse. My kids won’t let me serve on anything but paper. How odd that it’s stronger with the windows open. I really have no idea why, but if I had to hazard a guess it would be that the added humidity from outdoors is interacting with the buildup on your glasses and dishes. I’d strongly encourage you to thoroughly clean your dishwasher, and soak everything in a sink filled with 50-50 water and white vinegar then rinse and dry it all well with a lint-free towel. That should knock out the funk in the dishwasher and on your dishes. After that, don’t go overboard with detergent and keep your rinse-aid topped off. Best of luck! Thanks for this info. When we opened the cupboard doors the dog smell would just hit you. I made my wife throw away the mat she had on the bottom of the shelf. We rewashed all of them but as you say, they have looked crappy and etched for ages before they started to smell. We can’t wait to soak them and get rid of the wet dog smell that gags me when I drink out of them. We were about ready to buy a new dishwasher. I’m happy to have helped! Thanks for this! How do you figure out when your first rinse cycle kicks in so you can add the vinegar? When your dishwasher is done with the wash cycle it’ll start draining before adding fresh water for the rinse. That’s when you catch it. Alternatively, you can add it to your machine’s “Rinse Agent” compartment — if it has one — and it’ll take care of the work for you. I have the same problem with plates and cups too. I noticed that if I rinse them from washing up liquid with my clean hands and while I’m rubbing them they make that squeaky noise under runny water then I know they won’t smell fishy. But if I don’t rub them while rinsing them they all smell bad. This makes my hands really dry. I will try the vinegar soak, hopefully it will help my hands. That makes sense — rubbing them until they squeak means you’ve gotten rid of any soap or food residue which causes the odor. Thanks for sharing that tip! This problem is caused by leaving used dishes to soak in lemon detergent for some time wash right away without using too much detergent rinse and air dry. Well, I’ve never bought lemon-scented detergent in my life and yet have had this problem in the past. So…. Ugh, that smell! Put them in a sink filled with hot water and 2 cups of white vinegar and let them soak, then rinse them. I’ve never had this happen in a dishwasher, only when handwashed dishes are allowed to air dry. It’s worse if windows are open. How odd! It happens for many in the dishwasher, but you’re the first to let me know it occurs when glasses are hand washed, too. Thank you. I finally figured out why my glasses smelled after being washed in the dishwasher. I was over filling the soap. They never rinsed properly. I now fill to the line inside the soap cup and no smell. And I’ll save some money by not wasting soap! Good point, Gayle! Using too much soap in the dishwasher or the laundry makes things dirtier, not cleaner. Thank you for visiting!